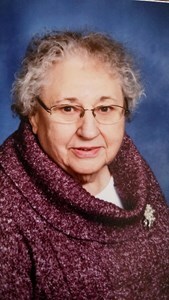 Naomi Wolf, 92, of Green Bay beloved wife of the late Edward Wolf, departed this life on Friday, March 29, 2019 at her home peacefully. Naomi was born on January 22, 1927 in Little Suamico, daughter of the late Irving and Adeline (Zoeller) Gauthier. She was a graduate of Alverno College of Nursing in Milwaukee. It was there that she met Edward. They were married and later made their home in Green Bay. Naomi worked as a Registered Nurse at St. Vincent Hospital until her retirement. While at St. Vincent she helped to open their first NICU at the Hospital. She was an amazing wife and mother. She worked hard to provide for her family. In her retirement she enjoyed gardening and was an active member of St. Mary of the Angels Church. She was a member of the St. Elizabeth Altar Society. She also enjoyed making blankets at Church for the needy. She is survived by five children: Donna (Dan) Christen, Kristi (Todd) Daul, Eddie (Birgie) Wolf, Nathan (Sheila) Wolf, and Peter Wolf. Naomi also leaves a sister, Rachel Chmielewski along with 7 grandchildren: Lynnelle, Chelsea, Ethan, Kristina, Antonio, Alexandra, and Wyatt and four great granddaughters, Mikayla, Eliany, Kelysia, and Janeiyas. Naomi also leaves many extended family and friends. She is preceded in death by her siblings: Alfred, Irving, Alois, and Gladys. Visitation will be held on Tuesday, April 2nd from 5 PM - 7 PM at Newcomer - Green Bay Chapel, 340 S. Monroe Avenue, Green Bay. A service celebrating her life will follow at 7 PM in the funeral home. Interment will be in Nicolet Memorial Gardens. To leave a message of remembrance or for directions please visit www.NewcomerGreenBay.com. Add your memories to the guest book of Naomi Wolf. My sympathy to the family. I worked with Naomi for many years at St. Vincent Hospital. We were ‘bedside’ nurses then and actually gave our patients bed baths and back rubs! I have happy memories of those years together. I wish you peace and joy in your special memories of your mom. Donna, I was saddened to read of your Mother passing. Naomi is such a nice lady. So caring and thoughtful. I remember the memories you posted. I often think about those happier days. My deepest and sincerest sympathy to you and the family. My momma. Lots of good memories with you and daddy. Building the house in Suamico, the new riding lawnmower, the new color tv (I was 16) had to bring my girlfriends over to watch. The foster children you cared for , especially my foster sister Mary Ann (Sporleder) Schiltz. Snooky and grandpa Wolf going fishing....the party for Mary Ann, on the slab in the back of the house in Suamico (before daddy transformed it into a kitchen) , apple trees, a garden , cleaning fish :-) , Going to grandma and gpa Gokeys for a visit. The big willow tree in the front yard. Daddy rocking my brothers and sister in the rocker and the pat, pat, pat of his hand on their behinds. The trips to Milwaukee, to visit family there. Just a few of the many memories I have to ponder on while I wait to see you again, mom and dad & Joshua (son) . I am going to miss our video chats mom. Boat rides! I extend my condolences and prayerful support to you all during this time of the passing of Naomi. She was a cherished parish member she will be deeply missed. Know that we at the parish of St. Mary of the Angels will keep all of you in prayer during your time of loss. Noami will be remembered during this weekends mass and next week.